Arrival, Check In, Visit WEB DuBois Center, Orientation & Welcome Dinner. Meet, greet and transfer hotel. Afternoon tour of W.E.B DuBois Center for Pan Africanism, established in his memory for his dedication to Pan Africanism. This museum was the house where DuBois lived and started his research for the production of Encyclopedia Africana. Dr. Dubois passed away on August 28, 1963, at the age of 95. His body is laid to rest on the compound of the center. Orientation & Welcome Dinner. Accra City Tour-Visit Kwame Nkrumah Mausoleum & others. Breakfast at leisure. 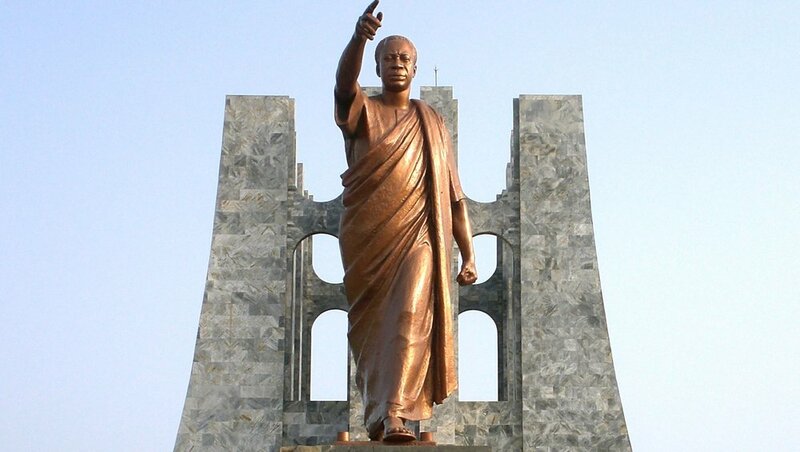 Morning Accra City Tour includes visits to the University of Ghana, National Theatre, George Padmore Library, Independence Square & Kwame Nkrumah Mausoleum, a park dedicated to the first President of Ghana. The mortal remains of both Dr. Kwame Nkrumah and his wife Madam Fathia Nkrumah are laid to rest in a tomb at the park. The tour ends at the Cultural Center for shopping. Prepare for the next day trip to the Volta Region. Morning departure on our journey through the scenic, rolling hills along the Volta Lake to Ho, regional capital of the Volta region. Situated among the majestic mountains, and the breath-taking floral green hills, this region of Ghana is by far the most beautiful in terms of scenery and natural landscape endowment. Arrive and check into Chances Hotel, situated under the misty hills of the Volta Lake. Afternoon visit to Agortime Kpetoe Kente Craft Center. The visit will afford you the opportunity to witness how the Kente fabric is woven and to purchase directly from the artisans who make them. Visit Wli Waterfalls, Monkey Sanctuary & Participate in Community development Activities. Early breakfast and we proceed through the magnificent vegetation and flora of the region on our way to the Wli Waterfalls, the highest and most consistent falls in Ghana. Legends have it that the water from the falls purify your soul and cleanse you of any ailments you may have. So you are welcome to bring your swimsuit for a dip. We’ll take a break on our way to visit the village of Tafi Atome to observe the true Sacred Mona Monkeys in their natural habitat. Believing that the monkeys are Messengers to the gods and their protectors, the Chiefs and the people of Tafi have been protecting the Monkeys for over 200 years. The monkeys are very friendly but you need bananas for them to come to you. Our journey thereafter continues to the town of Wli where we will cross the eleven log bridges of River Agamatsu to get to the Waterfalls. Journey to the Ashanti Region, the Cultural Center of Ghana. Visit the Ashanti Craft Villages. Cultural Experience & Shopping at the Ashanti Craft Villages: Very early breakfast and depart for Kumasi, Capital of the legendary Ashanti Nation and the Cultural heart of Ghana. On our way, we shall visit the three famous Ashanti craft villages for shopping and also witness craft making demonstrations - Ahwiaa, the woodcarvers’ village; Ntonso, the home of Adindra; and Bonwire, the Kente weaving village. These visits will afford you the opportunity to see how African crafts are made and to buy directly from the artisans who make them. Continue to Kumasi and check into hotel. Visit the Ashanti Palace Museum & the Kejetia Open Air Market. Morning visit to to the Manhyia Palace (home of the Ashanti King). This old palace which is now a Museum contains a collection of historical Asantehene relics dating as far back as the first King of the Ashantis; His Majesty Nana Osei Tutu Opemsoo, who was crowned in 1701. We’ll afterwards make a shopping visit to the Kedjetia, acclaimed to be the largest open-air market in West Africa. Prepare for the next day trip to the Central Region. Visit the River of Last Bath & the Ancestral Graves. Early breakfast and depart for Central Region. A few miles from Cape Coast we’ll stop at Assin Manso to visit the African Diaspora Ancestral Shrine and the River of Last Bath. Assin Manso is the place where the captive Africans were brought to rest and given their last bath before being taken to the dungeons of enslavement in Cape Coast & Elmina. On the compound are the ancestral Graves of the two Sarcophagus, Crystal a Jamaican woman who fought against racism and Samuel Carson and African American Naval officer whose skeletal remains were brought back through the Door of No Return in August 1998 and rejoined with their ancestors at the last bath. There is no longer the Door of No-Return; it is now the Door of Return. Continue the journey to Cape Coast. Arrive and check into your beach front hotel. Journey back to Accra/Farewell Dinner. Breakfast at leisure, check out of the hotel and depart for Accra. Arrive and transfer to your hotel to check-in. After freshening up we’ll proceed to a selected restaurant in the city or a Private Home for a farewell dinner. Return to the hotel. Prepare for the next day trip back to the USA. The Slavery experience and Visit Kankum National Rain Forest Park. Breakfast at leisure. Morning departure for tour of the Elmina Slave Castle (the oldest slave castle in West Africa). Be part of an emotional late afternoon tour of the slave dungeons and pass through the “Door of No Return” (the final exit to the slave ships on the high seas). Many who walk through these compounds of physical cruelties and torture chambers, can almost feel the presence of the slaves, in their iron shackles and hear voices from the past crying out in anguish. The experience would send chills down your spine and leave an indelible mark on your conscience. Afternoon adventure at Kankum National Rain Forest Park. 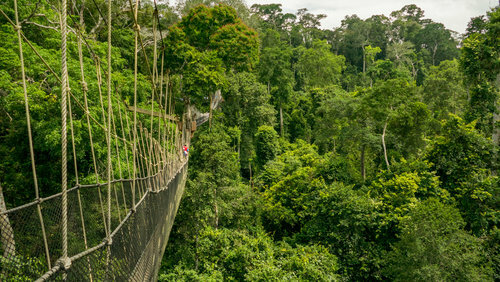 Challenge yourself to walk the seven bridges over the rain forest. Prepare for the next day trip to Accra. Free Day / Travel back to the USA. Breakfast at leisure. Rest of the day is for rest and relaxation. Eveneing transfer to the airport to check-in for your return flight.